We may be headed to Moon Palace for dinner tonight. I was pouring throught the detailed Shanghai Dinner on the other board but just needed to get down to a handful of solid recomendations. Any must-eat recommendations for two people are surely appreciated. The sauteed baby eel with ginger, braised pork shank (you may need to order ahead for this, so give them a call), and soup dumplings are all quite good, and would make a fine meal. Combine that with whatever vegetable they most like tonight, prepared in the Shanghainese manner they recommend, and you will be happy. If your waitress is Apple, tell her David Dickson says hi and really needs to stop by soon. Thanks for the solid recommendations. 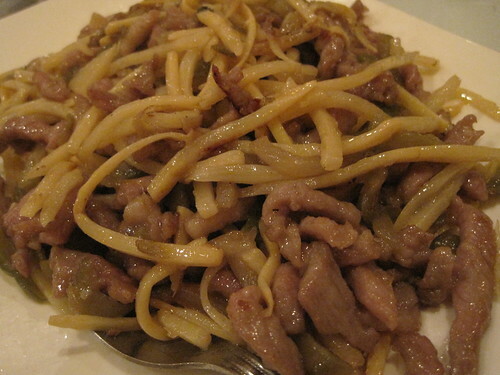 Try the fried noodles with mushrooms and bamboo. It's a nice, light dish to share and the take-home makes a good lunch the next day. 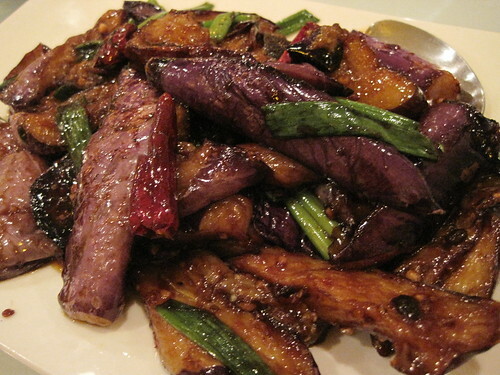 The braised bamboo shoots appetizer has a deep flavor. And if you need to go conventional, the mooshu chicken is outstanding. All the suggestions above sound pretty appetizing, but there are other ways to go. In the past, when asking for items off the Shanghai menu, which appears to only be available in Chinese, with no chowist (tm) translation available, I have been pointed to some americanized items, including spicy sauteed fish, with peppers and a slightly sweet sauce and hacked chicken, which is probably not too americanized. Those were tasty enough, but not terribly exciting. Still, you could ask for Apple and just have her give you some real chinese items like she made for (insert my name) party. Moon Palace's pork shank is incredible, rich, tender, succulent, just an incredible dish. I also quite enjoy their soup dumplings and cold platter, I can still taste the tender braised brisket. I will say that while I am, in general, a fan of eel, I am not as enthusiastic about the thin elver (sliver) eel served at Moon Palace. Not so much due to Moon Palace's preparation, but a few years ago I was served an order of elvers, not at MP, that were days past their prime and lost my taste for them. I hope you and your wife enjoy Moon Palace, looking forward to your impressions. Well, it looks like I'll need to put the great Moon Palace recomendations to use another time. Unfortunately, we ended up going to Hackey's in Printer's Row. We both went with the special of the day, the chicken pot pie. Needless to say, one should stick to the onion loaf and the Hackneyburger here. Thanks again for the suggestions, which we'll put into action soon. A few of us gathered tonight to present Moon Palace with the GNR award. The owner seemed wary, but ultimately pleased. The Hunan spicy fish was, as always, a hit. Because it takes 30 minutes to make, it's smart to order it as soon as you come in the door so it will be ready when the rest of the meal is. We also enjoyed the soup dumplings, the potstickers, the hot and sour soup (of course), the squid and scallops with salt and pepper, the Shanghai green vegetable with garlic sauce, and the fried noodle with black mushroom and bamboo shoots. I had not previously had the crispy chicken, which comes with an excellent complex sauce, or the pork with noodles and Chinese pickle, which was interesting and good without being intimidating. Dickson, I'm sorry to say, couldn't talk the table into the baby eels. Maybe next time. All this, plus a bottle of wine, a martini, and several more appetizers, for $22.50 a person, tax and tip included. Figured I'd drop a new note on this old thread... Had another solid meal at Moon Palace this weekend. It's become a pretty safe selection for Chinatown when I'm with a diverse group of eaters. My 7-year old nephew loved the Curry Chicken, and he's not easy to please. We go to Chinatown a lot, but rarely stray from LTH or LSC followed by smoothies at Joy Yee's. Our visit to Moon Palace was enjoyable, but not good enough to add it to the rotation. (I guess that's why it's not a GNR anymore.) The highlight, which is the main reason I'm bothering to post, was the slightly famous person at the table next to ours, Larry Gilliard Jr. who played D'Angelo Barksdale on The Wire. He and the table of producers/directors? (they certainly didn't look like actors), who I'm guessing were working on the TV show The Beast, seemed to enjoy their dinner. Still a big fan of Moon Palace here, though I admittedly spend much more time a few doors down at Double Li this year. Standard order is dumplings (xlb soup-inside style if they have them, otherwise just the Shanghai pot stickers with shredded fresh ginger over the top), sizzling beef, garlic eggplant, string beans with ground pork, and soup. Much safer and tastier for introducing cuisine newcomers than Emperors Choice or Mandar-Inn, which have disappointed me lately. Of course, I 'Pass Go' most of the time and take 'em directly to LSC, DL, LTH, SW, or 7T, but if you need full service, bar, tasteful decor, big portions, and minimal wait, Moon Palace is a good place to start (Phoenix right up there as well). The competence of the bar here is worth a mention - exceptionally knowledgeable and well-stocked for Chinatown. Reopening Saturday April 18, 2009 around 4 pm. I just called there and talked to a live person. They would have been open today but the computer/credit card machine wasn't working. Very glad to hear this, thanks for the update. I am considering a post-end-of-the-semester dinner for my fellow 2nd year law student friends. I've never been to Moon Palace, but from the pictures on their website, as well as the postings in this thread, it seems that this place fits the following requirements: 1) affordable; 2) authentic Chinese; 3) above-average decor and atmosphere befitting a semester-end gathering; and 4) well-stocked bar with reasonably knowledgeable bar staff. Sounds like a decent pick to me; the other place that comes to mind would be upstairs at Phoenix, which, say what you want about the dim sum, is a high-class joint in the evenings for my money. It's been a hit for the Art History and EAL department gatherings at my uni. Moon Palace is calm and quite friendly. I'd call to let them know your plans, and to make sure they still have their license and bartending staff after the closure, since things can change quickly in Chinatown (as elsewhere). Proof that Moon Palace does indeed have a full bar, makes a fine martini, and is still turning out the Hunan Crispy Fish. The new room is very nice and I think well set-up for events. Ann Fisher wrote: The new room is very nice and I think well set-up for events. I picked up food to go at Moon Palace this evening. We did my mum-in-law's birthday celebration there last fall. The room is just gorgeous. I let them know. Ann is correct about it being a great space for groups. My vegetable filled buns and vegetable delight with ginger and fried tofu rocked. This time the entree was full of tender baby Bok Choy-- BONUS!! I made my first visit to Moon Palace tonight with the happy_stomach clan. 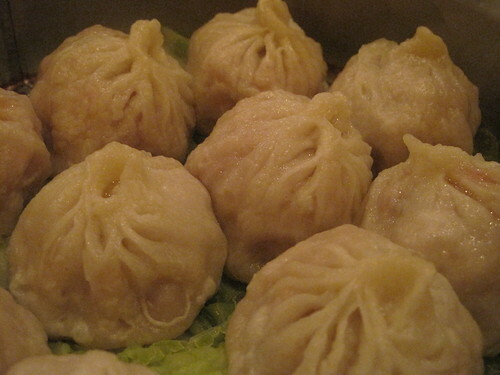 Wrapper of the XLB was gnarly, but the filling was porky and plentiful with nice ginger notes. Soup inside was MIA. 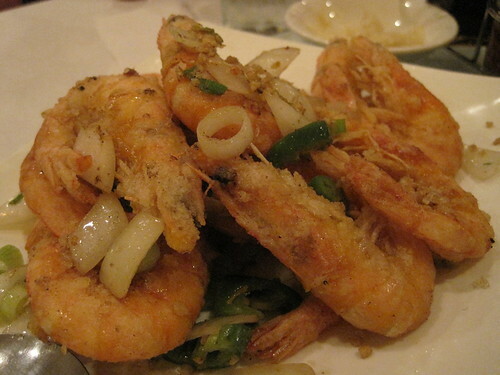 Salt and pepper shrimp were a fine version, though not the freshest crustaceans I've ever had. The shredded pork with Chinese pickles was subtle--could have used more sour--but satisfying, tied for favorite at our table with the spicy eggplant. The long, thick, fleshy cuts of eggplant and deep, smoky, spicy and sweet purples, reds, oranges and greens made me think I was eating julienned Loch Ness Monster. (That is, it rocked). Moon Palace seems like an all-around good Chinatown option; it worked particularly well for an early Sunday dinner with older family members.